Group B Strep: You've got questions, we've got answers. Here's everything you need to know about the risky bacteria and how it can be a problem during pregnancy. Group B streptococcus is a type of bacteria that lives harmlessly in many people's bodies—it is not the same as Group A strep, which causes strep throat. But while it rarely causes problems in adults, it can cause still birth or serious infections in babies if it gets passed on from mother to child during labor. Luckily, pregnant women can be treated to stop the spread of infection, which is why whether you carry the bacteria matters. Here, we have answers to some frequently asked questions about GBS and pregnancy. How do you catch group B strep? The source is unknown, however it is very common: about 25% of women carry GBS. Can it be sexually transmitted? Do I need to get tested for GBS? Yes. The Centers for Disease Control and Prevention recommends routine GBS screening for all pregnant women to diagnose whether a woman will need treatment for the bacteria when she's in labor. While the chances are very low, it is possible for a woman to pass GBS on to her baby, usually during vaginal birth. Pregnant women should get screened between the 35th and 37th week of pregnancy. The only exception is for women who have previously had a baby with a GBS disease or who have had a urinary tract infection caused by GBS during their current pregnancy. These women will be automatically treated for GBS. It's a fairly simple test that involves a vaginal and rectal swab, which is then taken for lab analysis. How long do I have to wait before I get the results? You should have your results within 24 to 48 hours. I've tested positive. Now what? The general treatment for pregnant women with GBS is to receive antibiotics (usually penicillin) during labor to prevent passing GBS to the baby. You should not take the antibiotics before labor, as this can diminish their strength during birth, when it matters most. Do I need to test for GBS if I'm planning on having a C-section? If you are having a planned cesarean birth, you will not need antibiotics for GBS during delivery if your labor hasn't begun and your water hasn't broken. 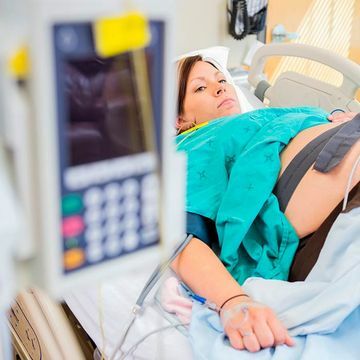 However, the American Congress of Obstetricians and Gynecologists (ACOG) says you should still be tested for GBS because labor may occur before the planned C-section. If you test positive, your baby may also need to be monitored for GBS infection after birth. How is GBS risky for my baby? Newborns can be affected by GBS in two ways: early-onset infections and late-onset infections. Early-onset infections occur during the first week of a baby's life, generally within 24 to 48 hours after birth, according to ACOG. The most common problems caused by early-onset GBS infections are lung infections, blood infections, and meningitis. Late-onset GBS infections occur after the first 6 days of a baby's life and can lead to diseases like meningitis and pneumonia. How high is the risk of passing GBS on to my baby? It's fairly low risk. Out of mothers with GBS not treated with antibiotics, around 1 out of 200 babies will develop signs of GBS. For mothers treated with antibiotics, those odds drop to 1 in 4,000. How common is it for babies to develop an infection if they are exposed to GBS? Only a few babies who are exposed to GBS develop an infection. Certain factors, like preterm birth, may increase the risk of infection. How is GBS infection treated in babies? Group B strep infections are treated with antibiotics, like penicillin, given to a baby through an IV. Additional procedures may be needed for babies with a severe GBS-related illness.